Educators may wish to use this unit in association with others in the "Antarctica's Climate Secrets" package to provide the needed climate context for this activity. To conserve time, students could break up into four groups and each group make one core. The groups could then swap cores and sample the core and determine the climate history of that core. If safety is an issue (using hammers to crush beads), the educator can prepare the beads beforehand. Maybe too childish for high school students? Font used makes it feel too young for high school students. For high school: add videos and augment with more real-life examples or case studies. In the activity, the cores are referred to as "rock cores" so teachers need to let students know that these are models of marine sediment cores from the ocean. 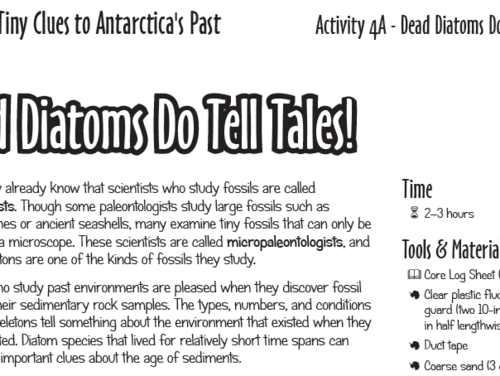 Comments from expert scientist: I think this is a great activity to get started thinking about diatom paleontology and how it is done. I think it provides a good model for middle school aged children to think about the interactions between sediment type, preservation, and physical processes. An excellent use of models to illustrate how scientists determine the nature of past climate history. This resource is part of a Flexhibit ("flexible exhibit") package. The hands-on activity allows students to use their experience with the unit to host a public science event or build an exhibit for a science museum or other venue. They build and interact with models and then learn to give science demonstrations to visitors. They become the expertsâthey do the teaching at their event, or they prepare interpretive signs for the props at their exhibit. The teacher guide (leader notes) for all the Andrill activities are at http://www.andrill.org/flexhibit/flexhibit/materials/activities/Leader_N.... They are not as complete as they could be. Instructions on how to order the materials needed for the entire Antarctica's Climate Secrets are at http://www.andrill.org/flexhibit/flexhibit/materials/activities/index.html. Students should have no problem following the clear and well written directions.